AW14 is just around the corner and we’re so excited we just can’t keep our Autumn/Winter lines to ourselves! The AW14 catwalks are positively awash with tactile textiles, bold colours, colourful, modern prints and asymmetric designs. At Walk in Wardrobe we have been busily sourcing our favourite AW14 collections and putting together our lookbook for the upcoming fashion season. Here are just a few items from our favourite trends we will either be getting very soon, or have just landed in at the boutique! Arty prints are in with a bang next season with stunning, colourful prints adorning the catwalk. The dress pictured left is from one of our brand new labels at the boutique and is a perfect blend of fresh, colourful prints with enough of an autumnal edge to make the outfits feel not too summery. Long sleeved dresses such as this one are also perfect for the Autumn when the sunshine hides from us a little bit, but there is still a comfortable level of heat. Long sleeves also have the advantage of hiding the arms (if that is a concern for you) and they look chic, sophisticated and utterly fabulous! This particular dress has the added advantage of streamlining panels down the sides to give you a great shape around the hips. The key thing to remember with this trend is that bold is better, so this gives you the leeway to go wild and express yourself! Next season, don’t be afraid to show some teeth (naturally I am talking about the teeth on zips!). Zips obviously have a very functional aspect to them (can you imagine a world where they hadn’t been invented? ), but for AW14, they are taking on a much more decorative role and appeared all over the place on the catwalks. Zips are often associated with grunge fashion, stemming from the punk era, but we feel that there is no reason why this AW14 trend can’t have a touch of femininity too! This top pictured right has a lovely little feature front zip where the skirt has a full length feature zip going up the centre of the back. It is made out of clever, award winning stretch fabric which moulds to the contours of your figure. The gorgeous, girly lace cut out lace trim keeps the outfit ladylike whilst keeping a slight edginess with chunky zips. This outfit also comes in black which makes it perfect for the wintery months. This cobalt blue pencil dress pictured left gives women a gorgeous shape whilst adding a touch of sexiness with the front split and it’s fitted shape. This dress is an absolute boon if you have issues with your tummy, the clever rouching across the midriff area means that you can hide any unwanted lumps whilst still remaining in a figure hugging, classic and shapely dress. Me in AW14 leopard print jumper! 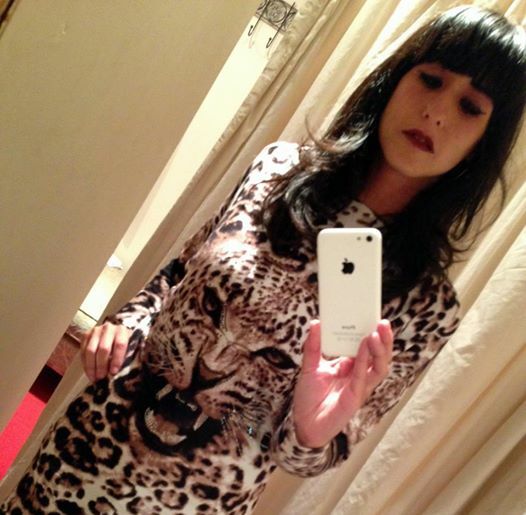 I would like to finish up with my own personal favourite for AW14 – leopard print. I have often been berated for my enduring love for leopard print as many people believe that leopard print can look trashy. However, whilst I firmly believe that an overkill on leopard print can look trashy, you can also wear leopard print and look classy, remember that it’s HOW you wear it! I strongly advise that you incorporate leopard print into your wardrobes for next season as it was placed at the forefront of the AW14 catwalks earlier this year. If leopard print is good enough for Balmain, it’s most certainly good enough for me. This absolutely gorgeous leopard print jumper pictured to the right is super soft and light weight, perfect for the transitional period between summer and autumn. It has the bonus of super-fashionable batwings on the sleeves and also a sprinkling of darling little crystals on the leopards head on the front. This is a long jumper so looks great with black leggings or black PVC leggings. We would love to hear from you about how you will be wearing the fashion trends above, so make sure you leave a comment below to let us know what you will be wearing this autumn/winter.